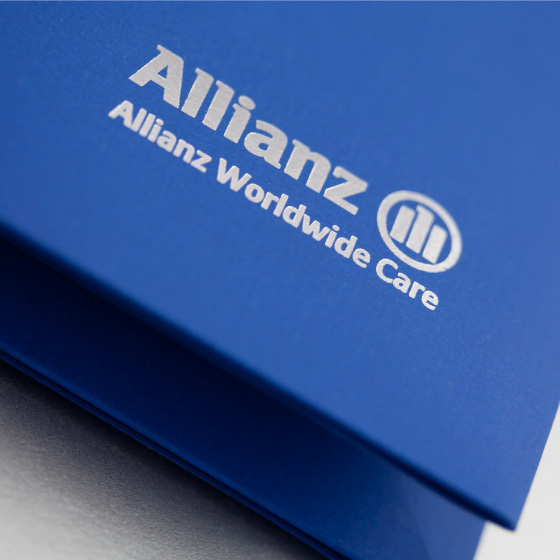 Allianz Worldwide Care provides international health and medical insurance cover for employees, individuals and their dependants, wherever they are in the world. Their services focus on providing local healthcare and support in accessing it to people living and working abroad, where they may not be as familiar with the local hospital systems. 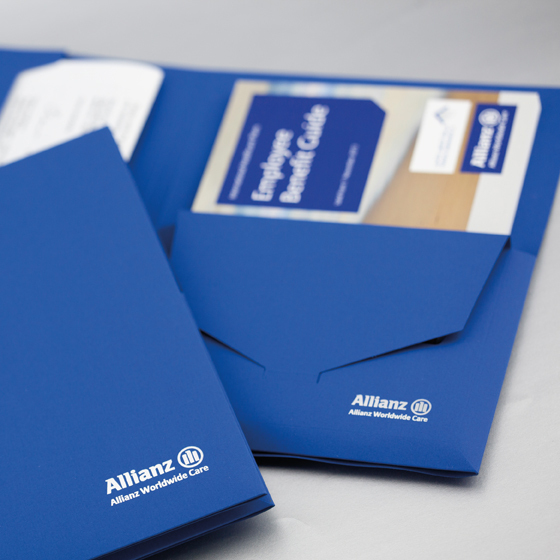 The vast majority of their service is provided over the phone and through other correspondence therefore the only tangible element customers receive is their membership pack. These packs are made up of policy documentation, benefit guide booklet, the most commonly used forms and membership cards for each individual insured on the policy. As the number of those insured varied greatly from one to at times eighteen individuals, along with documentation being produced in multiple languages, the variation in contents varied greatly, providing a nice challenge for us when it came to updating the existing pack. The existing pack was a faux suede vinyl wallet, similar to those that hold car owner’s manual. This fit the bill in many ways, providing the documents with a sense of permanence and seriousness, as well as a convenient, easy identifiable, shelf sized holder in which to store them. Where the pack fell down however was that the vinyl material would become attached to itself, and the documents making it necessary to ‘peel’ the cover from the contents. Other concerns were that the packs were not large enough to hold the bulkiest sets of contents, meaning that some elements had to be included loosely or in a secondary envelope. In addition to this we were keen to improve the pack from a sustainability point of view, by moving away from plastic materials and their shipping from the far east. Our solution was to design a bespoke die cut wallet, with two internal pockets for forms and booklets and an integrated envelope panel for cards. 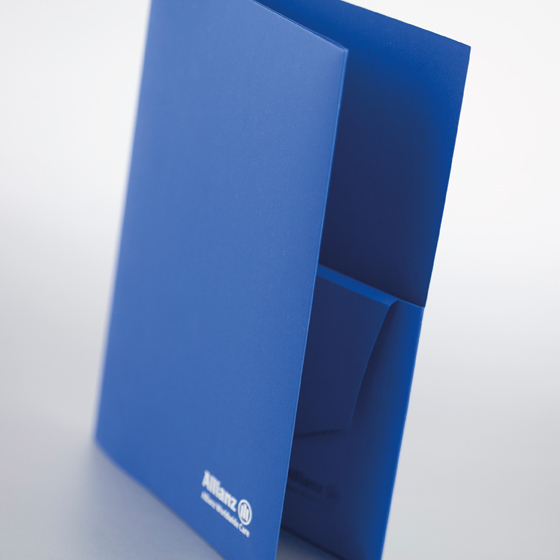 They are robust and substantial enough to hold thinner sets of contents snugly, yet flexible enough, thanks to some discreet folds and scores, to ‘pop out’ and house thicker booklets and more cards. The resulting pack has been very well received and is due to be reprinted for use in two new markets.